Col's Creating Memories: January Blog Hop! Welcome to the January Whiff of Joy Blog Hop! If you didn’t come here from the lovely Karina’s blog, then head on over to the start of the hop at Katharina’s blog. I don’t want you to miss a single stop on this hop! We are so excited to be releasing our first collection for 2013! Our January release is “All for the Boys”. If you struggle to find really special stamps for that wee boy in your life, then you are going to love this new release. These stamps are all “boy” and feature all the things that boys love. We have even designed special dies and have wonderful boy-themed charms to ensure that your “boy” card will be perfect in every way! The hop will remain open until midnight CEST midnight Sunday January 13th. Winners will be announced by Katharina on her blog. I have used this awesome stamp 'King of the Skies' and he is just gorgeous to work with, both my boys love him! 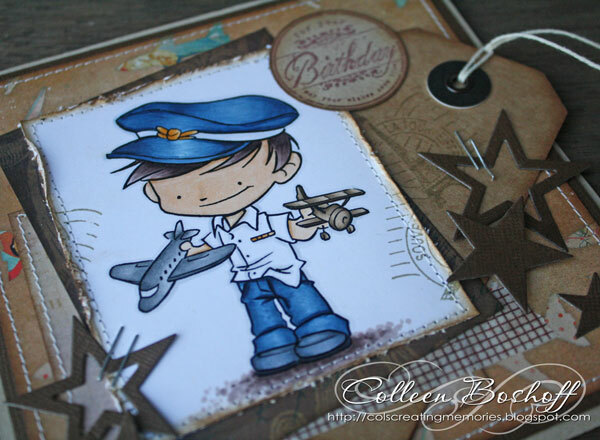 The papers are Glitz Design 'Happy Travels and the aeroplane patterned paper was perfect for my 'King of the Skies', the sentiment is Whiff of Joy 'Festive Occassions'. I finished my card off with some washi tape, a tag, some stamping and stitching, inking and some stars - here is another closer look. Thank you so much for joining Whiff of Joys blog hop and for your lovely comments. What a imazing great wonderful card, like it very much. Love these new stamps..... your card ia soooo fabulous. If I was a boy I would really love to have this card for my birthday; awesome!!! A beautiful card,Colleen, wonderful boys-card!! Very nice card! Above all I like the colours! What a wonderful card This image is very cute. Terrific Collen! Typical for a boy's card. Love it. WOW Beautiful card Colleen, lovely colours and stars. Bella card e bel timbro!! Bello il contrasto del blu!! Eine sehr schöne Jungenkarte - und toll coloriert! Wat een prachtige kaart , je hebt mooie kleuren gebruikt. Wow,die Karte ist wunderschön!!! Die Idee mit den Sternen und dem Tag gefällt mir super gut!!! Your card is beautiful. I love the colours and all the details on your card. this is my favorite stamp of the new collection and I love the card you made with it. Adorable! 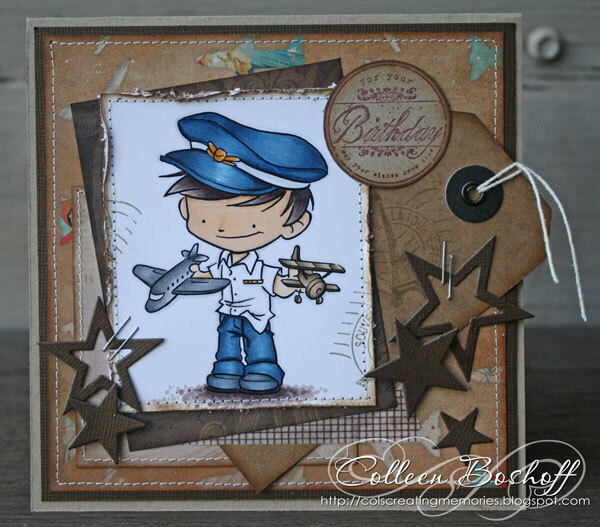 Beautiful coloring, awesome stars and use of the kraft paper! This must be one of my favourite of the new release. Great card and love your coloring. very nice card love it. Wonderful card!! Love how it comes out with the stars and the fitting paper! Your card is very cute!!! I love all the new stamps...soo cute! But I have a girl...;) Anyway....I also can create for others, eh? ;) Such a awsome card and thanks for the gerat Blog Hop! Absolutely, positively darling card! Thank you so much for sharing your creation with us! What a cute stamp and great card! Such a cute image...love the image,the stars and the tag. Wonderful work! Love your style and the amazing details on your creation. Have a nice weekend. I'm realy falling in love with all those new stamps. They're all very cute! Love the tag! 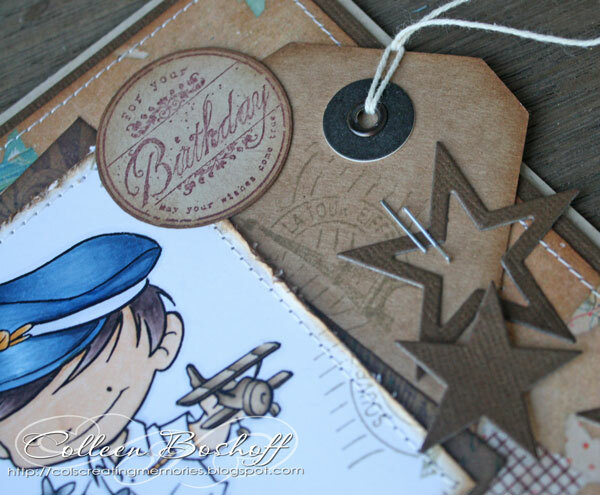 Beautiful card, love the stampin and the tag with the stars. Your card is beautiful ... so a wonderful boys-card! That image is fantastic and i love the way you made a card out of it... looks great with all that stars! Perfekt lovely work!